Enjoying time on the water is one of the great joys of life in California. With the ocean, numerous rivers, and thousands of lakes, water is (and we note the irony of this statement amid a long drought) everywhere. Jet skiing is one of many water-related activities that California residents and visitors enjoy. While it can be great fun, both riders and bystanders must remain aware of the danger of jet ski accidents. When a jet ski accident can be traced to a negligent individual or corporation, our Northern California jet ski accident law firm can help hold those responsible accountable for their actions and help the injured victim or grieving family recover monetary compensation. Recently, two jet ski-related tragedies darkened the mood at Central California’s popular Bass Lake. On June 27, an accident left a 13-year-old boy dead and his 16-year-old aunt critically injured. According to the Madera County Sheriff’s Office and The Sierra Star, the pair were, along with the boy’s father, riding in an inner tube and being pulled by a pontoon boat when they were hit by a jet ski. The waverunner was piloted by a San Jose man with two riders on-board. Police do not believe alcohol was a factor, but the jet ski was allegedly outside of the three designated waverunner zones. The owner of a lakeside resort suggested the operator may not have understood that waverunners do not stop simply because the operator lets up on the gas. Tragically, after Bass Lake’s first fatal boating accident in a decade, another crash claimed a second teen days later. Around 11 P.M. on July 1, a 14-year-old Los Gatos boy and his 18-year-old friend were riding jet skis when the younger boy hit a moored pontoon boat and was tossed into the water. Despite efforts of bystanders and rescue workers, he died at the scene. The Contra Costa Times reports that the boy’s godmother described him as an expert jet skier. The sheriff’s office is investigating. According to the U.S. Coast Guard’s report Recreational Boating Statistics 2014, 34 people died and 592 were injured in a total of 891 reported personal watercraft (“PWC”) accidents during 2014 (“jet ski” is a brand name that has come to stand for the category). PWC accidents made up 17% of all recreational boating accidents and PWCs were second only to open motorboats in the number of fatalities per vessel type. Operator inexperience and operator inattention were among the most commonly cited primary contributing factors in PWC accidents in 2014 (167 and 107 accidents, respectively). Other primary contributing factors include: Improper lookout (186), Excessive speed (149 accidents), Navigation rules violations (109), Alcohol (40), and Machinery (4). At least 246 of the reported PWC accidents involved a rented vessel. We urge readers to use caution around jet skis, whether they are onboard or simply nearby. People frequently underestimate the power of these vessels. A careless rider, a rental company with lax policies, a manufacturer that made/sold an unduly dangerous PWC, or anyone else responsible for a jet ski accident can and should be held legally accountable. 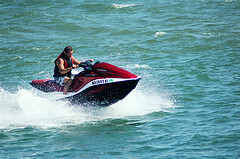 Our San Francisco jet ski accident law firm can help. Money can’t erase an injury or bring back the deceased, but it can help victims move forward and ensure they aren’t saddled with the potentially huge economic costs in addition to the physical and emotional toll of an accident that wasn’t their fault.